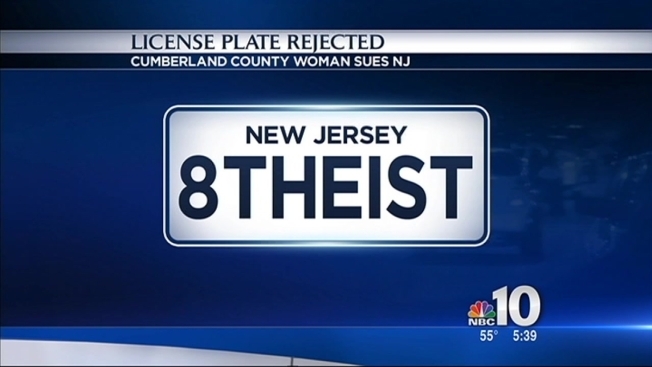 A New Jersey woman claims she was denied a license plate proclaiming herself to be an atheist because it might be considered offensive. Shannon Morgan said in a federal lawsuit filed Thursday that the Motor Vehicle Commission violated her First Amendment rights when its website rejected the plate reading "8THEIST." The Maurice River Township woman says she also asked for a plate reading "BAPTIST" as a test. The website accepted it. Messages and emails left for the Motor Vehicle Commission were not immediately returned. A recorded message said the offices were closed because of Good Friday. New Jersey previously, after a brief flap, approved a request from an atheist group's president for a license plate with the word "atheist." His plate had the number one in place of the letter "i."